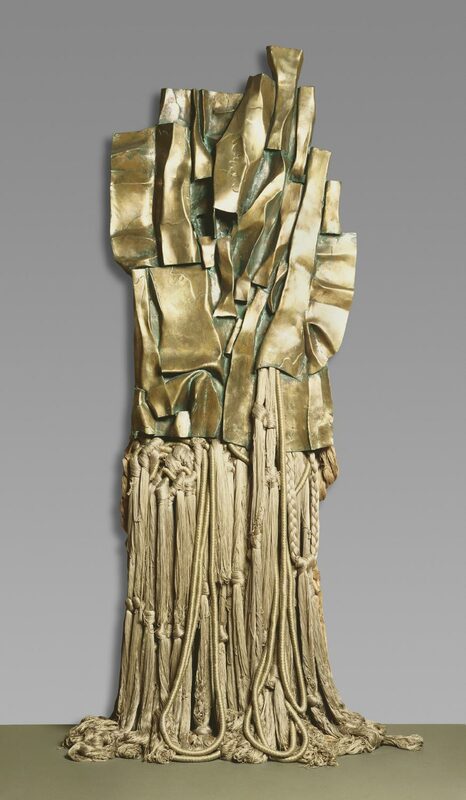 Best known for her lavish abstract sculptures that fuse fiber and bronze, Barbara Chase-Riboud has pursued a long and successful artistic career that began at the age of seven, when she enrolled in art classes at the Philadelphia Museum of Art and its affiliated Samuel S. Fleisher Art Memorial. Malcolm X, No. 3, is one of a series of four sculptures that she dedicated to the African American civil rights activist and Muslim minister, who, following his pilgrimage to Mecca, eloquently advocated brotherhood between the races. The reconciliation of opposites has long been a goal for Chase-Riboud; she has described her work as uniting such opposing forces as male and female, black and white. This approach is clearly apparent in Malcolm X, No. 3, with its subtle combination of bronze and silk, hard and soft forms, rough and smooth textures, ancient and modern sources. Born and raised in Philadelphia, Chase-Riboud studied at the Tyler School of Art in the late 1950s. Following her graduation, she won a John Hay Whitney Fellowship to study in Rome. She later traveled extensively in Africa, where she encountered the art and artifacts of ancient cultures, especially Egypt, that would have a profound impact on her own art. Other inspirations for her work include Chinese art and such giants of modern sculpture as Alberto Giacometti, David Smith, and Isamu Noguchi. In Malcolm X, No. 3, the influence of African art resonates in the hanging ropes and threads of silk that bear a resemblance to the raffia, netting, and fringe found in certain African masks. Ultimately, though, the artistic expression of the sculpture is distinctly Chase-Riboud's. Her dignified homage to the militant African American leader, in the form of a towering golden-hued monument, celebrates the spirit of one of the most charismatic and provocative figures of the twentieth century. Michael Taylor, from Philadelphia Museum of Art: Gifts in Honor of the 125th Anniversary (2002), p. 133.